We pride ourselves on being competitively priced and having a schedule that anyone can work with. When contacting other martial arts schools to compare us, ask if they do upgrade programs (price increases when students advance in programs), higher tuition for higher belts, long-term contracts or mandatory tournaments. We do none of these. You will see all our pricing up front with no high pressure sales. You can choose the plan that best suits you and your family. Our programs are listed below. First, most students start with our Intro Program. 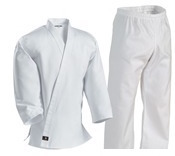 For only $30 you get one week of classes and a karate uniform (gi). The uniform alone is worth more than that and is yours to keep. This package gets you the uniform you will need for class and a few classes to try us out and see if our dojo is a good fit. $1,290 per year if paid in full and no registration fee! Hero Discount - Thank you for your service! Active Military and Law Enforcement Officers get 10% off their tuition. PRIVATE LESSONS, $30 for a half-hour session. Save when you prepay a package of four lessons for $100. This special pricing is available for our active karate students and their family members. KARATE BELT TESTING, starts at $35 for first four tests, then $45 for each one through the last brown belt test. The first test is usually after a couple months. Tests become further apart as rank increases. Successful testing, done by invitation, includes new rank and belt, and the opportunity to receive an official rank certificate when still an active student for at least a month after the test and you attend the Certificate Ceremony. Little Dragons tests are $20 each, and they have two additional graduated belts between kyu belts. GIFT CERTIFICATES for private lessons and/or karate retail are available for $10 on up. Still not sure? Here's a coupon!